What is the greatest threat to our civilization? If you were to ask a cross section of people in your life, you’d likely get an array of responses: terrorism, climate change, corporate greed, anti-intellectualism… the list goes on. I’d wager that at least a handful would insist that the root of all of our problems is overpopulation. 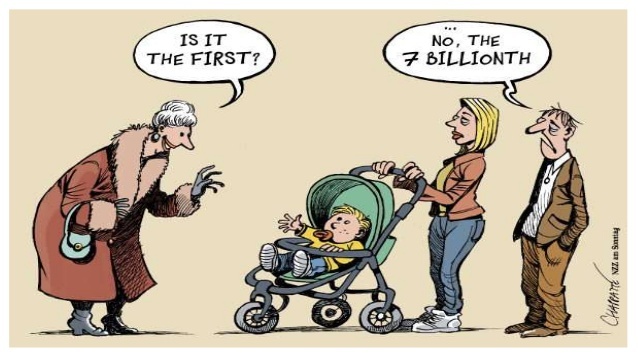 In 2012, the Earth saw the arrival of the 7 billionth extant person. What is climate change if not the inadvertent result of having to provide modern industry for billions? What is conflict if not the product of too many people vying for a diminishing pool of finite resources? By this line of thinking, all of our modern social ills can either directly or indirectly be linked to simply having too many people on a finite planet. It’s important to acknowledge that this perspective is often tinged with racism: “it’s those people over there (you know who they are) that are having too many children.” There’s also a significant dose of classism: “it’s the uneducated lower classes who are having too many kids, while the people who should be reproducing aren’t.” And, frankly, there’s a basic denial of history. It’s not as if we didn’t have war, cruelty, suffering, and anti-environmental practices back when there were significantly fewer of us. But what I would like to discuss today is the basis for the assumption that population growth is out of control, and whether that assumption is valid. It was probably Malthus who first pointed out that population growth is geometric (exponential), while agricultural growth is arithmetic. Hence, he reasoned, every population must inevitably outgrow its food source. Political instability and border insecurity naturally follow, when growing populations seek to nervously protect their shrinking resource base. Critics of Malthus pointed out that human populations, unlike bacteria, do not grow exponentially; fertility rates vary geographically and over time. New models of conceptualizing economies –factoring labour as capital, for example– contributed to the valuing of large populations as assets rather than detriments, allowing industrializing nations to convert population to production and therefore to wealth, which further allowed them to more easily purchase resources that were becoming in greater demand. Malthusian collapse did not occur on the schedule predicted by the doomsayers, due largely to improvements in agricultural sciences and something called the Demographic Transition. It’s this latter thing that gives many demographers hope that the world’s seemingly unrestrained population growth might be slowing, soon to be plateauing, and eventually reversing. The Demographic Transition was first proposed by Warren Thompson in the 1920s and is well described on BBC’s educational site. From observing changes in Europe over the past few centuries, Thompson and his intellectual heirs suggested that human populations evolve through five stages of demographic development. In stage 1, we live pre-industrial lives, dependent on the land and at the mercy of the elements. Diseases are plenty, lifespan is short. Infant mortality rates are very high, such that we don’t even name our children until we are sure they will live beyond infancy. The cost of a child is simply the price of feeding that child, whereas its value as a labourer is high. So both death rates and birth rates are high, and the population is neither growing nor shrinking. In stage 2, with the arrival of public health measures, like clean municipal water and vaccination, infectious diseases begin to recede, and mortality declines, particularly among children. But the cost of children is still low, while their utility is high. So reproduction behaviours remain largely unchanged. But overall population size increases dramatically. Many so-called developing countries would have been in stage 2 in the late 19th and early 20th centuries, accounting for their explosive growth. In stage 3, social factors intervene to contribute to lowering the birth rate. The data inexorably show that when infants survive and when women are socially empowered, fertility rates drop. As economies shift from agrarian to industrial bases, more people move to cities. In fact, so many countries have entered stage 3 that the human race is now a majority urban species. The introduction of cheaper and more easily used contraception methods, and the use of this new social wealth to invest in public education (especially for women), leads to smaller families. The cost of children increases with housing, clothing, and educational demands, while their utility diminishes, as they are no longer needed for agricultural labour. A a result, in stage 3 population size is still increasing, but at a slower rate. Western Europe would have begun emerging from stage 3 sometime in the 19th century. Large nations like India and China, with their expanding middle class, are likely in the latter half of stage 3 or beyond. In stage 4, we begin to transition to a services and information economy. There are no economic incentives for reproduction, so reasons for family growth remain largely religious or emotional. Birth rate and death rate are almost balanced; and, like in stage 1, there is minimal or zero population growth, as the total fertility rate approaches replacement rate (slightly over two children per couple). Most believe that Canada is a stage 4 nation, as are the majority of Western nations. Rapidly modernizing stage 3 nations may be progressing to stage 4 quickly. China is a fascinating example of a very populated country that is approaching a sort of demographic cliff, since a majority of its people are over the age of 30 and are having fewer children than their recent ancestors. Many demographers recognize a stage 5, as well. In stage 5, birth rate drops below death rate, and the population shrinks. Japan is a stage 5 country. This is an economically problematic stage, as subsequent generations are too small to provide an adequate tax base for maintaining social programs. Immigration policies must be re-thought, and governments begin to experiment with strategies for encouraging larger families. Obviously, the Demographic Transition is a theoretical construct with some vulnerabilities. For example, it is unclear whether and how long deep religiosity can compel modernized and wealthy generations to reproduce at rates that are against their economic self-interest, leading to what some theorists call a “demographic trap”. As well, it is possible that globalization can create a disincentive for economic modernization, as some populations are compelled by global pressures to remain agrarian or manufacturing-based, never to progress to an information- or services-based economy. Climate change, antibiotic resistance, and the unpredictable nature of international politics can easily confound a nation’s otherwise straightforward progression through the stages. However, given that the basic tenets of the Demographic Transition are being observed in real time in such living social laboratories as India, China, and parts of Africa, many see it as reasonable that the world as a whole is in the process of transitioning. 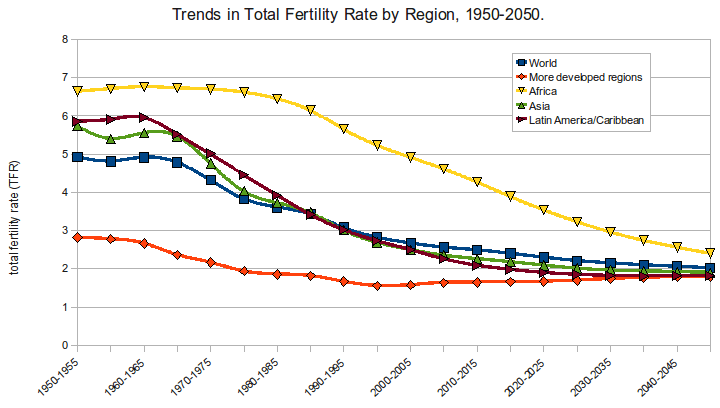 So what does all this mean for global population trends? With large scale investments in public health campaigns, reproductive rights initiatives, and wealth-building programs, we have seen dramatic reductions in the global fertility rate in the past few decades. The majority of the human species might be transitioning to stage 4, which means that while total population size is still growing, it is growing much more slowly. The relative growth the world population is expected to drop to 1% by 2020. Though, even with that slow increase we are on schedule to reach the 9 billion mark by 2050. Projections suggest that the total world population should plateau at about 13 billion by 2100, and actually decline thereafter. It took wealthy nations, like the United Kingdom, a century for fertility rates to fall from over 6 babies per woman to fewer than 3 per woman. It took China and Iran a mere decade, because economic and human development initiatives are better understood and better targeted. There is every expectation that we can make similar gains among current nations with high fertility rates, such as Niger and Somalia. Draconian measures, often tinged with xenophobia, are not necessary to slow the expansion of human presence on our planet. Nor do we need pandemics, famines, or wars to cull our numbers, as I’ve heard some shamelessly suggest. So long as we continue to invest in education, public health, access to contraception, and global trade, our numbers are likely to decline naturally and painlessly.